Our Samhain Ball was a smashing success! 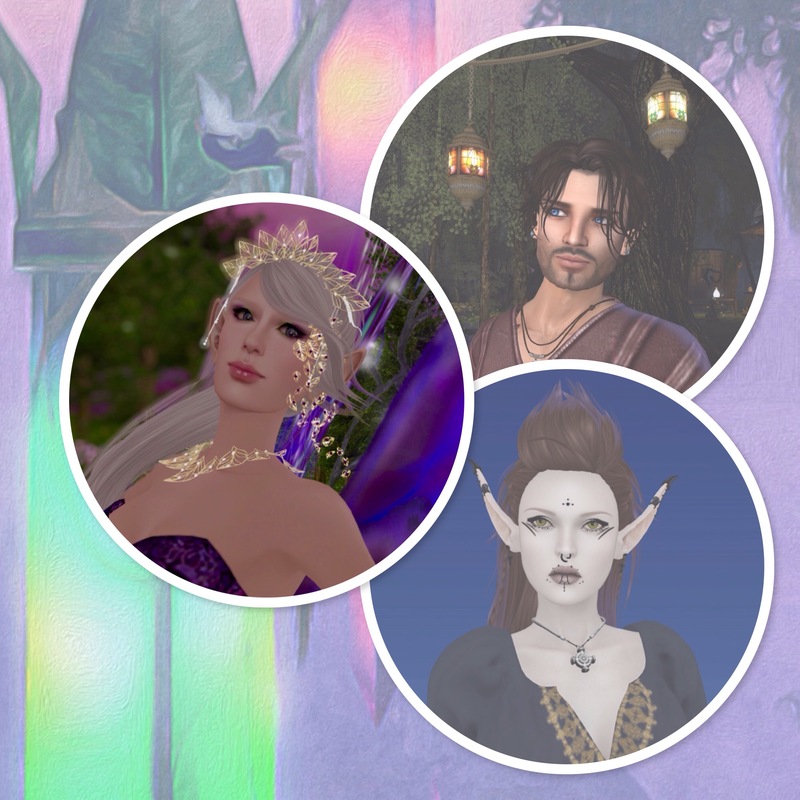 I don’t have a lot to say about it, except what I’ve already said about Drysi and that ridiculous bunch of Sidhe noble boys who got their comeuppance fairly quickly at Arahaelon’s hand, but here are some photographs in case you want to know how some of us looked on the night! 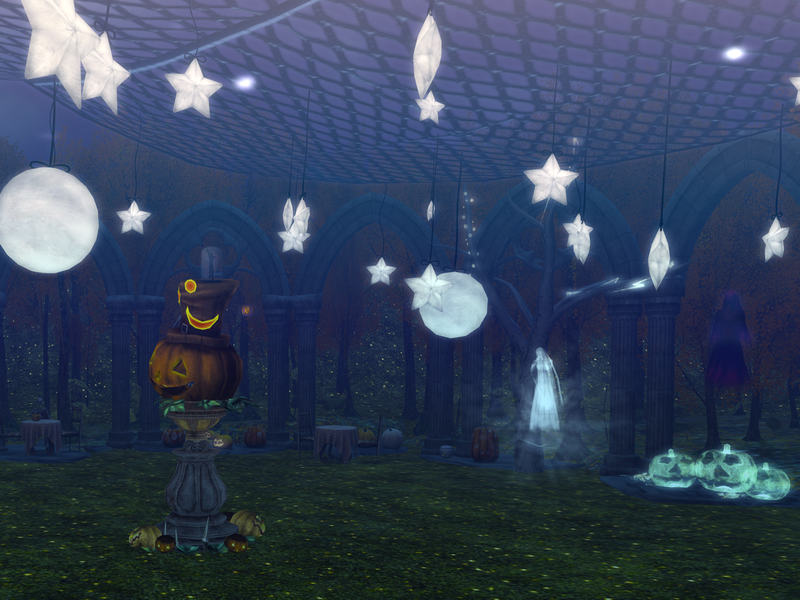 Dyisi, Wren and I decorated the ballroom OOCly a few days before the party. There was much laughter, particularly since I had to admit to both of them that I love Samhain, but not Halloween so much, and I don’t like blood and gore, so there were many jokes about what I would and would not have in the ballroom on the night. And just don’t talk to me about tombstones. Nathaniel having a drink with a skeleton. Wren says he’s probably talking about that time he used to be on a boat. Wren and her skeleton dog would have won our costume contest, if we’d held one. Nathaniel and Gwyneth. Gwyneth looks like she may break into a burlesque routine at any moment. Dyisi and Kern. Kern argued that he already is a Samhain/Halloween creature, so he came as himself. We couldn’t even get him to put a mask on. 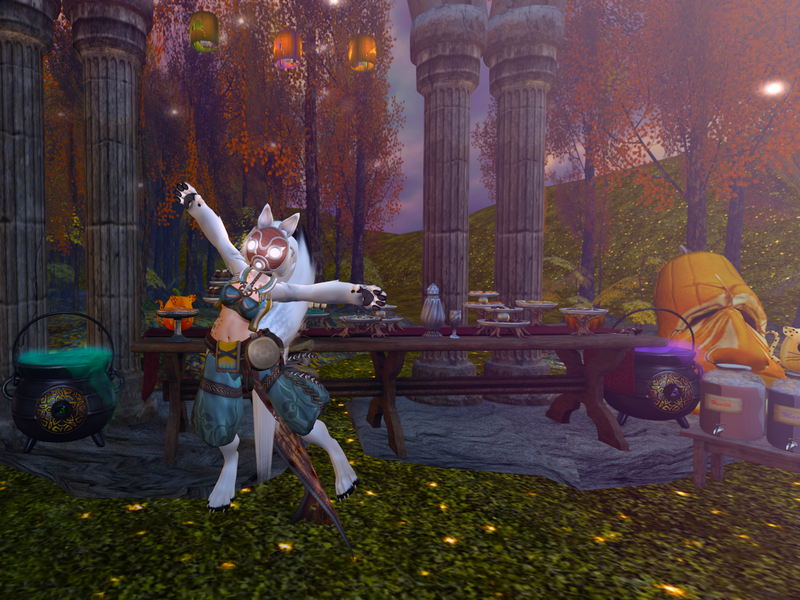 And finally a shot of Dyisi and Gwyneth. Dy was in human form for reasons I won’t go in to because it would take so long, but whoa! was she tall! I talk a lot about getting out of the Great Seelie Forest. It would probably be easy to get the impression that I don’t actually like my realm very much, but that would be a wrong impression. What you don’t hear about here in my little ‘blog’ (I love that word!) are the day-to-day activities that make life as Queen of Faerie a bit of a grind. Meetings, negotiations, handling wars—all that stuff is frankly very boring to me and I would rather pass it off to advisors and people who know more about these things than I do. But I do love the magic of my Realm. That’s why even when I do get out of Faerie, I tend to present most things from within Faerie, if that makes any sense. I think it’s a Fae Queen’s job to keep on top of fashion, and of course as Queen it’s not like I can wear the same dress to this month’s masked ball as I did to last month’s masked ball: people would talk. So without further ado, here are some of the beautiful things I found at Fair Play. Sometimes, I want to be a Dark Queen. Sometimes, I want to be a Dark Queen. The Seelie have such a snooty, xenophobic reputation, and there is the obvious misunderstanding that we are beings of Good while the Unseelie are beings of Evil. That’s simply not true: I have met some truly evil Seelie Royalty in my time, and you could never, ever convince me that our former Unseelie Queen, Faermorn, was a creature of evil. My children are born of both courts, and while I see darkness in them all three, I do not see evil. Perhaps that’s because I am their mother. Or maybe I’m just an optimist. Stop laughing. This dress is from Vengeful Threads. This dress is from Vengeful Threads, and it’s called Queen of Tides. There’s even a necklace that comes with it, built along the same theme. Now of course my fae element is water, so much of my power comes from the sea. Tides are a powerful force. As the summer begins just barely to wane, I begin to think about how I will get us through the autumn, and remembering that the sea isn’t just a summer place is a good way to start. When I find a dress like this that makes me imagine myself in some future role, or even some role I may never have but would long to have, I love finding just the right things to go with it. And lo! and behold, a mask maker called Chimeric Fashions had such a beautiful mask at this event, and it seemed to be made for this dress. It’s their Butterfly Domino mask and it’s available at the Fair Play faire in three different colours. Of course, no Fae Queen’s wardrobe would be complete without an array of wings, and these are from masterful winemaker Deviance. Amusingly, they’re called Unseelie Wings. I know I got them at a shopping faire years ago, but I think you could still find them if you wen to the Deviance store. Clutie helped me braid my hair into this beautiful style I learned from Analog Dog called Ever, and there I was, the Queen of Tides, ready to survey my realm’s rocky beaches and bleak coastlines. It’s enough to make a girl forget she’s landlocked. Oh, but who is the Queen of Tides? Is she an explorer? A warrior? A sorceress? Only time will tell. Sometimes, I feel the Wyld coursing through me. Sometimes, I feel the Wyld coursing through me, and that’s when I need to let my hair down (all the way down) and not worry about whether it’s just come out of a long braid and is curling in unmanageable wildness everywhere. I used to work so hard to control my hair, but now I only do this for special occasions, and letting it down is definitely my preferred method. Possibly because I’m lazy, and possibly because I love the oils Clutie finds to dress my hair. This dress, from Blue Moon enterprise, makes me want to leave my hair down, take my shoes off, and dance. I love all the names designers pick for their dresses, and this one has a personality: it’s called Asiza, and again it comes in an array of colours. This dark purple, called grape, is my favourite, and since we’re peeking in to the dark time of the year, I can tell you that it makes me think of harvest, of singing through hard decisions, of preparation but not overcompensation. In September, when the nights are still warm, I will put on this dress and go among my people with a bottle of mead and a song in my heart. There are of course problems unique to Royalty. There are of course problems unique to Royalty. I nearly laughed my head off one afternoon when Aoibheann and I were getting ready for some event or other and I was taking hours choosing a circlet to wear. I finally settled on one, and I said, “This is a very versatile crown.” She burst out laughing at me. I’m not kidding: she pointed and everything. “Do you realise what you just said?” she asked. “Some people make these kinds of decisions about a belt, or a ring, but you have to make them about crowns.” And then she laughed some more. When I find a good circlet, I snap it up because I’m always looking for circlets and crowns that will go with a variety of gowns and levels of dressing-up or -down. Independent Objects has a booth at Fair Play, and they’re offering this lovely circlet called Mearwen. It is beautifully designed, serious enough to be Queenly without being overpowering (I mean, really, you don’t want to go out without your crown if you’re a Queen, but you also don’t want to wear an intimidating mass of metal on your head if you’re just going out to water the flowers, right?). Even better, it is enchanted so you can change the colours of the jewels, and that means it will go with almost anything. I honestly had a hard time taking it off. Speaking of different moods, sometimes I miss wearing trousers! Speaking of different moods, sometimes I miss wearing trousers! I remember when I first came to the Lucky Leaf, all those years ago, Aoibheann being completely scandalised that a woman had shown up in the pub wearing trousers. Nathaniel loves to relate that story when he’s telling people about the mortal girl I once thought I was. Jinx makes such beautiful dresses, but I fell in love with this trouser ensemble, because these are trousers I can realistically wear in Faerie. It comes with a matching pair of shoes, but the thing I really love about it, and this is probably my long-lost LARP background talking, are all the laces! Now, if I had to dress myself every morning, they might be a bit of a pain, but my fae attendants love being able to lace me into things, and I love the luxury of being laced into things as well. It’s called Kessick and comes in six colours that could be realistically mixed and matched, since they’re all complementary. Once again, the circlet from Independent Objects is a perfect accessory for the outfit, since it’s so very versatile. Oh! And the wings! These wings don’t come from Fair Play, but they’re so whimsical and fun, don’t you think? I found them at The Fantasy Collective and had such a lovely chat with the wingmaker, La Biche, but she would not reveal to me the magical secret for making the little stars inside the wing membranes actually move! Then again, if great artisans like her revealed all their secrets, everyone would be making wings as beautiful as these. She named them, appropriately, Galaxy. Even though I need no wings to fly, wearing wings makes me feel like more of a flyer, if that makes any sense. And our Court Skin Painter (yes, I have a Court Skin Painter!) found this beautiful design from Fallen Gods that I have asked him to paint on me again and again. It’s called Persephone. Kern made me choose this dress. His reply surprised me. He took my hand (and that man’s glamour just makes a woman shiver all over!) and said softly, “My Queen, you used to dance. I used to watch you, in the mornings, dancing in the bower, every morning. Your Court duties make you forget sometimes that you are a dancer, always. And this dress will help you remember that.” So in the end I chose the Silver colour of this, Mistique’s beautiful Samina dress. I love the detailing on the bodice, or bra, or whatever you want to call the top bit. I love the detailing on the bodice, or bra, or whatever you want to call the top bit, and the little appliqué motif matches the belt beautifully. Such a lovely thing to wear, with all the hanging beaded fringes moving as I move, turning as I turn, dancing as I dance. The dress called for a hairstyle that moved as well. The dress called for a hairstyle that moved as well, and this long ponytail from EMO-tions is a favourite of mine. It’s called Mystery, and I’ve had it for some time. I come back to it again and again, and my Court hairdresser and I have several little jokes about it being that one old ponytail I just can’t seem to stop wearing. The headpiece is also from EMO-tions, a new item in their shop, and it’s called Genesis. It’s meant to go with another of their hair styles, but I think it works beautifully with this one as well. The lavender beads swing freely round my head and remind me of those long earrings I used to wear as a teenager in London. So we came home from the Faire. So we came home from Fair Play, and we arrived back in the Great Seelie Forest just as dawn was beginning to break. 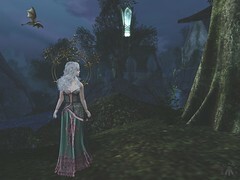 I had worn the Samina dress home from the outing, and Kern was right: wearing it made me remember I was a dancer again, and so I danced the dawn in on one of our exotic Trumpet Mushrooms from the amazing home and garden designs of Cerridwen’s Cauldron. So yes, I danced the sun up before we retired back to the treehouse for a much-desired full English breakfast (Bran does these things because he loves me! ), coffee, tea, and all the promise of today. And today is a great day for Fair Play. 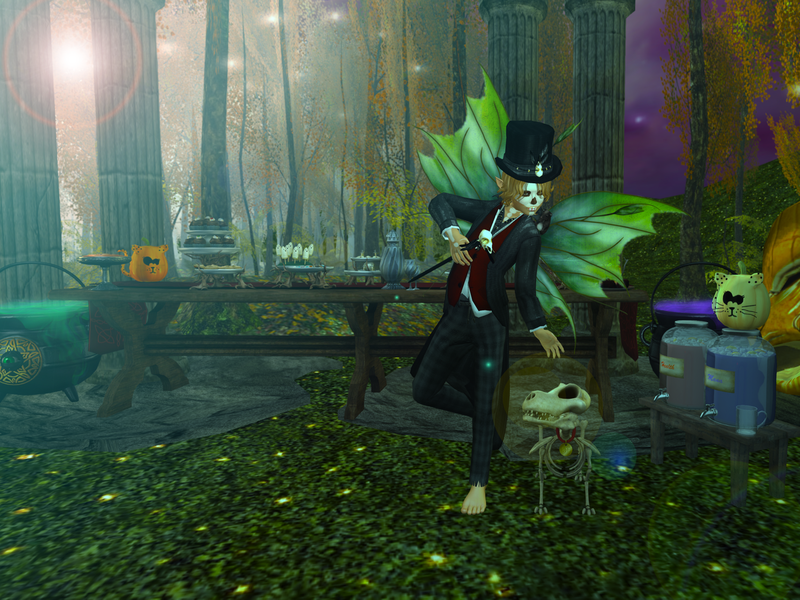 The Fair Play event opened today, August 1, at midnight SLT. There are so many more beautiful things there than I could possibly show off in just this one post, so expect some more goodies from Fair Play to be showcased here over the next few days (or weeks!). The Genesis headdress is NEW from EMO-tions and available at the EMO-tions Main Store. 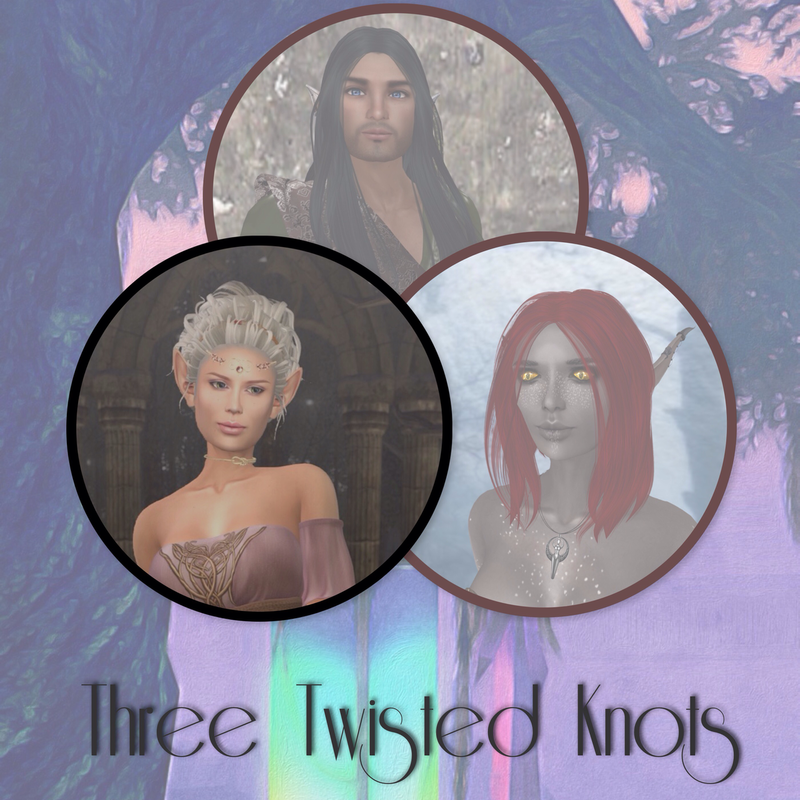 Location: The Great Seelie Forest, Wicked Wylds. See all the photos on Flickr?